There’s a holiday for every day now, and July 1st is no different. Happy Creative Ice Cream Flavor Day! I’m not big on making strange ice cream flavors just for the oddity of it, so this one sounds weirder than it is. During strawberry season, we always make a pilgrimage (OK, we take a 45-minute drive) to Butler’s Orchard to pick up a crap ton (technical term) of strawberries. We could get strawberries closer to home, but Butler’s strawberries are better. They are small, ruby-red, and flavorful, without a white pithy core in the middle. 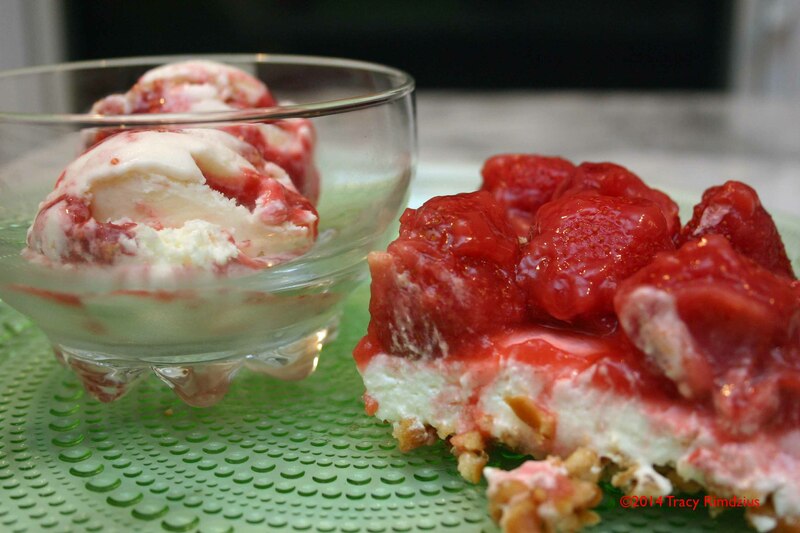 Having tired of the annual strawberry pie, I picked up a leaflet from Butler’s a few years ago that contained a recipe for “Strawberry Pretzel Salad.” It’s not a green salad, it’s a dessert salad. I think the “salad” name is for the gelatin in the original recipe. The crust layer contains crushed pretzels, butter, and sugar. A mixture of cream cheese, sugar, and whipping topping covers the pretzel crust. The recipe calls for a topping of sliced strawberries and strawberry gelatin, but I never make it that way. I don’t think Jell-O has enough flavor and I don’t like the texture of it in a creamy dessert like this. I also try to avoid using gelatin for my vegetarian friends. So I make a cornstarch-thickened strawberry pie filling to pour over the strawberries on the top layer. What does any of this have to do with ice cream? So glad you asked. Not only did I make strawberry pretzel salad ice cream, but I also made the real thing to ensure my ice cream tasted as much like it as possible. Of course, I had to eat them side by side…for science. My first attempt above was tasty, but the cream cheese made the ice cream hard to scoop. I added more sugar to the next batch and that seemed to do the trick and better approximates all that sugary goodness of the whipped topping in the filling of the original. 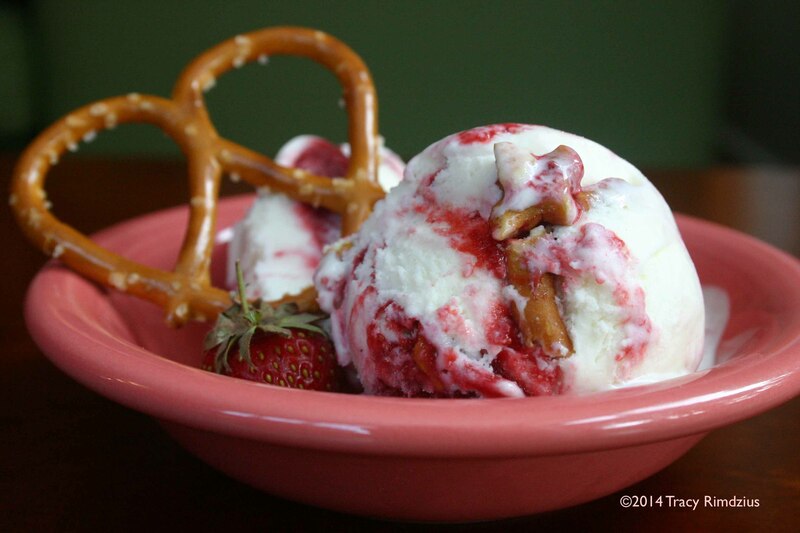 I swirl thickened strawberry puree and sprinkle pretzel crust into the churned ice cream.